GREENSPIN is a startup company from Würzburg, Germany, that works in the area of data analytics for better agriculture. In this blog post, Dr. Sebastian Fritsch tells us how GREENSPIN is using Earth Observation data available via the Registry of Open Data on AWS to improve agricultural practices. What challenges in the agricultural sector is GREENSPIN solving? Many people and organizations are talking about agriculture. How can we make it more sustainable and climate-resilient in the future? In most cases, we don’t have the necessary information at hand at the right time to make those decisions. We rely on generalized and often outdated statistics. For example, the 2018 heatwave in Central Europe may result in major crop losses, but the amount lost can only be determined after the harvest. These may be local estimations of actual yield losses. This is a tough situation for government authorities who need to distribute financial aid to affected farmers. It also affects the industry, grain traders, and processors who need reliable numbers for planning. This is where satellite data can help provide a clearer picture of what is really going on in the field in near real-time, and at a much earlier time and more accurately than any estimate. There are many more examples where satellites can help us to better understand our agricultural systems. The Sentinel 1 and 2 satellites of the European Union’s Copernicus program are beginning to play a major role in agricultural subsidy monitoring in Europe. At the field level, satellite maps can help better distribute fertilizers and pesticides and keep environmental pollution at a minimum. GREENSPIN is helping private companies and government authorities implement new and complement existing processes based on these new types of data. 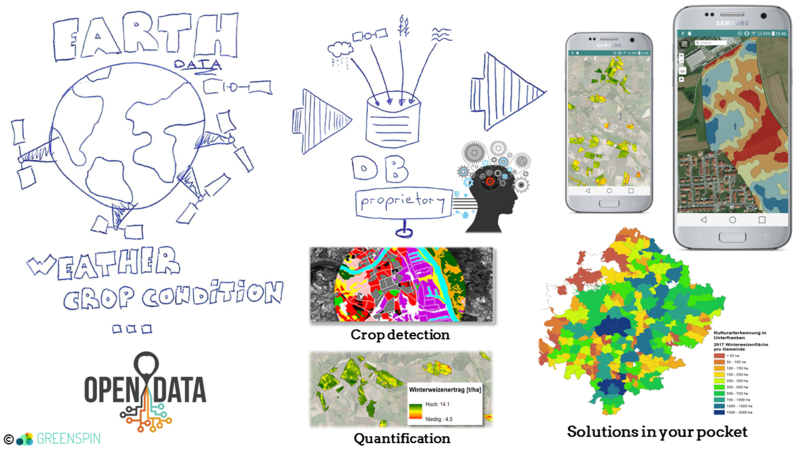 We combine Earth Observation data, artificial intelligence, and spatial web applications to solve challenges for different actors along the agricultural value chain. These actors include smart farming providers, grain processors, and public authorities. While the basic technology is the same, the way we process data depends on the use case. For example, for smart farming companies worldwide, we offer a web application or API that can analyze crops and field conditions in near real-time. These companies use our app to bring precision farming to their customers or integrate our data into their farm management systems. For grain processors, we analyze the total crop area, yield, and production in any given area throughout the season, before any public statistic comes out. This makes the supply side of the market more objective and transparent and helps to optimize buying decisions. Together with public authorities, we implement monitoring tools for automated subsidy controls. Seeding, ploughing, and harvesting times as well the type of crop that grows on each field are the type of information we gather for our partners to help them comply with new regulations from the European Commission. It all comes down to spatial agricultural intelligence: identifying where fields are and what grows and happens on them in near real-time throughout the season. How have you implemented this solution? GREENSPIN services are based on the automated processing and analyses of open Earth Observation data from the Copernicus satellites, Sentinel 1 and Sentinel 2. It takes advantages of these Earth Observation data sources to offer near real-time insights at affordable costs, just a few minutes after the data is available for processing. Due to the full automation of data analytics, GREENSPIN AGRI PLANET services are fast, scalable, and can be included into our partners’ software solutions by APIs capable of real-time processing. How was AWS key to this? GREENSPIN uses data from various sources, including Amazon S3 buckets for Sentinel-2 datasets. Currently, GREENSPIN works on an on-the-fly reading directly within the S3 bucket to offer its services worldwide with consistent quality and speed. We have found that AWS is the only provider that offers such a service together with high availability and stability. What was the outcome and what is next for GREENSPIN? Our app can be used globally. The next step is to adapt the app to different segments and find partners for each one. In the near future, we will incorporate data from radar satellites (Sentinel-1 A and B), which are also available via Amazon S3 buckets. Global availability of the data enables us to provide the data outputs with equal quality all over the world. For global deployment of some of our results, we will soon be using AWS Lambda to provide solutions quickly every time new data is available. Were there any highlights for you? Being able to scale up data products from a relatively small pilot region up to global availability just by changing a few lines of code is a highlight for us. Learn more about the Registry of Open Data on AWS.